Bill's picture of Oscar Sevilla caught him out of the saddle. Oscar won the Mens Pro division. The day dawned warm and bright. Perfect for standing along the road shooting pictures of cyclists huffing up the hill. The spectators were fewer than those found in the Pyrenees or the Alps, but just as avid. Everyone on two wheels that passed by racing or not enjoyed indiscriminate cheering from the "crowd". Our trek began at the start line and we hiked up the road past the first switchback at Monroe Truck trail until we found a good bit of incline and straightaway to catch the riders. 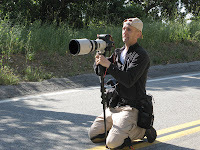 A commercial photographer, Kurt Jambretz of Action Images covering the race for Cycling News and Velo News took the center line. He records the major domestic races TOC, Tour du Georgia, Tour of Mississippi, Sequoia. Malaysia was recent outing. His photo of the Tour of California 2008 caught the riders on a coastal bridge with a rainbow in the background graces the latest copy of Velo News. Kurt had a good eye for the riders form as well as equipment. Look at the rigidity of the upper body of that athlete. They are using an absurd amount of energy to keep their torso tight. Oh...thats unusual, that athlete is using their inner right foot to do all the pedaling. All of the professional riders greeted him on the way down after their time trial was over. 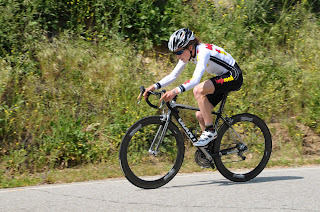 The results from the time trial are listed on Southern Calif Velo Site. Oscar Sevilla took the stage at 13 minutes 5 seconds. Cycling news also covers the race. Lots of home court action tomorrow and I am taking a day off from work to watch. It has nothing to do with basketball and all about cycling. Time trial. Mountain stage, and 790 riders. What's not to like? 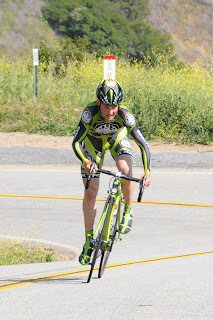 The opening time trial of the San Dimas Stage Race (SDSR) begins 9:00 am. Its a full day of non stop action with riders staged 30 seconds apart until 4:30 pm. 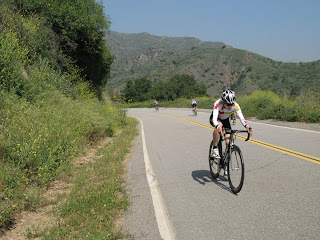 They climb a 3.8 mile segment of Glendora Mountain Road. The start list contains many dedicated souls. Of course the eye catching pro names are Tyler Hamilton - Rock Racing, Ben Day - Toyota-United, Ivan Dominguez - Toyota-United, Oscar Sevilla Rivera - Rock Racing, Tom Zirbel - Bissel, and Tony Cruz - BMC Pro Cycling Team. The start of the ride is in the canyon where the moisture level is high and the temperature is 10 degrees cooler from the stream. But once you make the first switch back and travel upward the sun sears down on the exposed flesh. It doesn't take long to feel the heat if the sky is clear. A butterfly flaps its wings. A cyclist pushes their pedals. A motorcyclist brakes into the mountain and flips over. Saturday was a happy crew of cyclists pounding the pavement up the hill. Lots of cheerful hellos, wave of the hands and nods of the head. 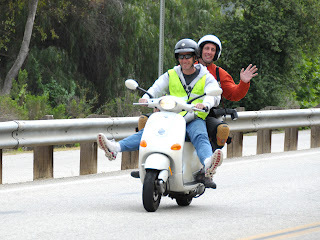 Lots of folks practicing for the San Dimas Stage Race happening March 28,29,30. One club the La Grange had a full compliment of riders. They spaced themselves out and were regularly breezing past me. The best equipped cyclist had her own personal chase scooter following her up and down the mountain. Pure luxury. Easter Sunday meant fewer folks. Daniel of La Verne was slow enough for me to catch. His pace didn't match his 12 mph calves. The higher cadence with the small gears reminded me of Lance Armstrong catching the big gears of Jan Ullrich. As I passed, Daniel noticed my Polar Power Meter and said he bought the wired version. 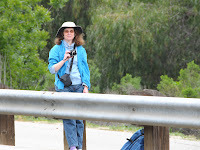 We rode together just past the first saddle where a yellow monitoring box TW3 is located. It was nice to have the company up the mountain. Daniel was recovering from an Achilles heel surgery and cast from a basketball incident. I have been recovering from a Plantar Fasciitis pain after taking the stairs at work. I stretched out after the ride. Its great to be back out on the road. Outdoor miles for the year: Number of rides: 15 Miles: 198.4. Pace:? ?.